Uninspired and running late, tiny Washington mussels for $2.99 a pound caught my eye at New Seasons yesterday. 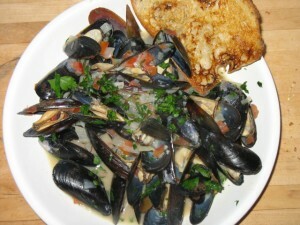 I dipped back to produce for a tomato and parsley, ran through the monsoon that had hit in the ten minutes between cavorting on the sunny banks of the Willamette with the le-Beastowicz and snaking through checkout, and 45 minutes later had a steaming bowl of mussels ready to go. A two-day-old sourdough boule handily gave its life for garlic toast (slice thickly, toast, rub with raw garlic, spread on butter), so pasta wasn’t even necessary. And remembering our moules in Bandol, I rooted through the liquor cabinet for something licoricey. No Pernod, but plenty of ouzo, and in went a capful. (Really cool what it does to the flavor, and it’s subtle. You only notice it if your’e looking.) That’s the beauty of mussels. As long as you have some flavorings, liquid and acid, you can pretty much do what you want. My base is sauteed onions, garlic, enough dry white wine to make a broth, and tomatoes, parsley and dash of salt at the end. But you can replace wine with clam juice and lemon, use stock, lemon and wine for more soup, add cream, replace onions with shallots or leeks…as long as your mussels are good (and clean) it’s hard to go wrong. Though a handful of shoestring fries with aioli would have been welcome, we made do with a big green salad and the remaining wine. 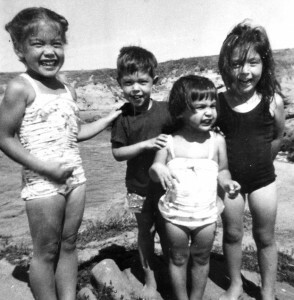 Siblings b, c and I couldn’t be more different (pictured here with cousin Renae on the right). At least it seems so to us. While the outside world may see three self-reliant, factually careless critics, we see a decisive impatient, a gregarious persistent, and an unsure complacent. But we do have one or two areas of commonality beyond that pesky “why wouldn’t everyone want to know our opinion?” thing. Even after living apart for over 30 years, I can guarantee there’s a pantry in Jacksonville, one in Portland and another in Minneapolis that are genetically linked. I can probably guess the foodstuffs I’ll find in my siblings’ kitchens with 90% accuracy. And we’re not talking eggs and milk, or even balsamic and soy. All families probably have this: a common peanut butter brand, an inexplicable fondness for Grape Nuts, galangal in the spice cabinet…. 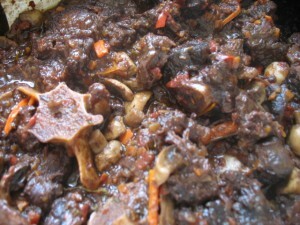 For us, it’s capers and Korean black bean paste (kochujung). 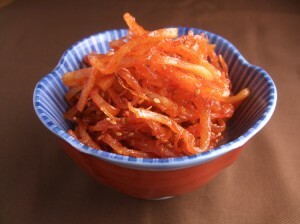 Red pepper paste and pickled peppers. Smoked oysters, sardines, chutney. A pound of herbes de Provence, a gallon of sesame oil. The peppers may be of a slightly different bent —one woman’s sambal olek is another’s sriracha— but there they are in various pasted and pickled forms. Our spouses have managed to influence us slightly, so while b’s fridge may sport South African salted mango, mine holds sauerkraut, and c’s has three shelves (at least) dedicated to the pickled accoutrement necessary for getting one’s self pickled. It’s not just the condiments. Years ago at a family gathering I was handed some tomatoes and told to make a salad. At first bite, my brother’s girlfriend’s eyes grew wide. “Oh my god it tastes exactly like his!” Who knew? Apparently the taste memory of tangy/sweet, oily/salty, oniony/tomatoey lies deeply embedded. And perhaps we hold the same conviction that the point of a tomato salad is to saturate great hunks of bread with the remaining juice, and for that, the proportions have to be just so. Today, gray salt, dijon mustard, truffle oil and wasabi are ubiquitous, so our genetically related pantries are less unusual than back in 1985. But there’s still some comfort in knowing that if we serve feta, it will be sliced, sprinkled with herbes de provence and black pepper, and drizzled with olive oil. That if you’re asked to cook dinner at someone else’s house, you’ll not only find toasted sesame seeds, anchovies and lap cheong, but you’ll find the “right” kind of mustard and plain red wine vinegar for the “right” vinaigrette. My kitchen talents lie in creating something palatable from the random elements of a picked-over pantry. The Top Chef challenge I’d have a shot at? The Quickie Mart competition. Let’s see, corn nuts, blue Icee and gum…I’m thinking an appetizer of opposing tastes and textures. Okay so maybe not, but at the risk of sounding like a certain chicken-nugget-spewing “semi-homemade” Stepford wife on the Food Network, the right staples and condiments are my key to banging out decent unplanned meals. My fridge holds a battalion of encrusted jars of mysterious origin and frightening expiration dates. The basics, of course: Worcestershire, Tabasco and oyster sauce. Pepperoncini, olives, pickles (kosher, dill, bread & butter). Fermented black beans, green curry, sambal olek, crab paste and tamarind juice. Cheap lumpfish caviar (thanks for the Ikea tip, Cyn!). Tahini, that must-have for emergency hummus, and with which I’m still trying to replicate Al Amir’s roasted vegetables. Tubes of emergency salvation (paprika paste, tomato paste, anchovy paste) that invariably slide down behind the jars, losing themselves for months (oh hell, who am I kidding? years) behind the walnut oil, kimchee and green peppercorns. How long will an open jar of sun-dried tomatoes in oil keep? No, not what does the label say, how long do you REALLY think they’ll keep? They’re priceless for topping crostini for unexpected guests (and there are always feta dregs and pinenuts in the crisper…). Five of those suckers whizzed with a half-glass of old red wine turned mediocre pasta sauce into something quite delicious the other night. And admittedly, it only takes a few minutes to roast and peel red peppers, but what if you’re staring into a vacant fridge for inspiration and are not willing to battle the store? Or weren’t willing to pay a ridiculous dollar-a-pepper? Or finally unearth the pepper you remember seeing, only to find it sadly shrunk, shriveled and shivering in a forgotten corner of your fridge? Or the dried tomatoes in oil have developed mold and because you love your friends and don’t want to be responsible for their death, you need a replacement? What was the point of this paragraph? Oh yeah, jarred peppers. Since (wo)man can’t live on the pickled and fermented alone, my micro-pantry (a two-shelf, thigh-high corner spinny-cabinet) hides cous-cous, canned hominy, coconut milk and tuna. A range of canned beans: white bean salad with olive oil tuna? Dinner’s ready! Black bean and corn salad with cilantro and salsa? Three-bean salad, hummus, chili? Done, done and done. I have stacks of dried legumes too, admittedly so much better, but those take forethought and don’t fit the sleazy theme of this post. And on to noodles…pastas covering the Italian heritage, gray Korean yam noodles, Japanese rice noodles and Chinese lo mein supporting my Asian bits. 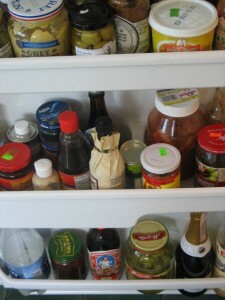 Ohhhh, did I forget to mention premade sauces? (What would a “confession” be without the really embarrassing admissions?) Although the collection has shrunk in recent years after reading labels and trying to avoid MSG and hydrogenated oils, I wouldn’t know how to make my quick pozole without those tiny cans of Herdez tomatillo and casera salsa. And how could I make a five-minute meal with leftover chicken bits and frozen peas without Trader Joes Masala sauce? No peas? No chicken? No problem, there are always garbanzos and frozen spinach at hand. And while I can make a legit Thai dressing when backed into a corner, who will know that you’ve plopped that disgusting sweet chili sauce (I’d guess 5 plops) into the fish sauce, ginger, garlic and lime juice in place of cane sugar and chiles? I’ve even resorted, on occasion, to topping the salad with pre-roasted, salted peanuts rather than frying my own, and god help me, k. prefers the short-cut version. Polish heretic. Are there lows even I won’t sink to? Yes. (Fake lemon juice and pre-peeled garlic come to mind.) But we each have to find our own way, and answer to our own higher power. Odd to celebrate laziness / shortcuts / unhealthy habits during my “year in the slow lane” (if you talk to k., do me a favor and call it 10 months). I have NO excuse for a fridge devoid of fresh veggies, sides of meat in need of butchering and an array of tinctures from which to make my own sauces. But bad habits are hard to break. And since someday I’ll be back to 65-hour-workweeks (won’t I? someday? ), it would be a shame to get rusty. Plus, I am taking this time to ditch some truly disgusting habits, and work out some new 15-minute dinners. I recently found an even more convenient form of one of my convenience food staples (oh the wonders of the modern world!) but that’s a topic for another day………. The nearest I’ve been to L’Aquila was a prosciutto pilgrimage to Norcia, an hour or two north through the rugged mountains. 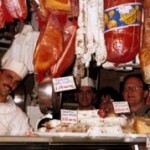 That 2001 three-week visit took us from Umbria through Emilia Romagna, and cemented my undying love and appreciation for the country, its people, and all things Italian. It’s such a cliché. News flash! Middle-aged woman loves Italy. Whoa! No freaking way! The transcendent, deceptively simple, micro-regional food. The rainbow of ochres embedded in weathered textures of tile and rock. The man-made treasures, by turns soaring and quietly pious, from the polished perfection of Ravenna’s mosaics to a seemingly endless treasure trove of worn frescoes. Gardens etched out of tiny plots of land, brimming with lemons and towering artichokes, temples of a different sort, and perhaps a more direct means of worship. Italy: the home of my favorite meal, favorite church, favorite picnic, favorite ‘drinking beers standing on the sidewalk’ afternoon. Home to the waiter who changed into work-clothes between courses to serve us lunch…when the restaurant didn’t actually open til dinner. It all boils down to the warmth and generosity of the people—people who will communicate through any means necessary, and who, if I may make a sweeping generalization, seem to understand grace at a cellular level. Compared to the tsunami or Katrina this earthquake is small potatoes. But this week, memories of just-caught cozze, frizzante mornings and spontaneous home-made lemoncello and grappa tastings are mingling with recollections of walking home to the Haight after the ’89 SF quake. Wading through a Union Square drenched in shattered glass, joining clusters around car radios, moving with the crowd of silent walkers spilling west, north and south from downtown, gathering breath before hustling under an overpass, cresting Buena Vista to see the smoke and fires pouring up from the Marina… But all I faced was an entry system that relied on electricity, a collapsed chimney across the street resting heavily on someone else’s car, a broken vase with rancid water. We spent our evening drinking on a friend’s stoop (vodka tonics, if I recall), shaken, freaked out by the pitch dark and thumping helicopters overhead, and sick for those in the Marina and under the collapsed concrete of the east bay. But we still had a place to sleep, to work, to live. Our shallow roots were undamaged. Hearing today that a friend’s family is actually from L’Aquila cements my sorrow at what they must be suffering. Her relatives have been accounted for, so they’re “lucky”. But their homes are destroyed, their businesses gone, their town extinct…in 30 seconds…and this in a land where roots run generations deep. I keep thinking that the act of caring enough can psychically absorb a piece of their shock and trauma. Stupid, really. But until something more useful comes to mind, I’ll pay homage thinking of unprepossessing Norcia with its squat, cement buildings, graceful and functional fountains, women in silk stockings taking their passeggiata with suited beaux of 40 years. Truffles and cured meats aside, this isn’t a spot on a tourist map, just a town where people work, eat, sleep, laugh, live and die. Perhaps a bit like L’Aquila. wandering her cities and ascending her torrid hilltowns. and all the sudden hand gestures of my compatriots. of kings or tour the dripping corners of a dungeon. little bed on Elba, or view the bones of a saint under glass. than be dwarfed by pillar, arch, and basilica. Why hide my head in phrase books and wrinkled maps? eager to eat the world one monument at a time? rivers of idiom running freely, eggs over easy on the way. willing to photograph me with my arm around the owner. what I had to eat and how the sun came in the window. down a road that will never lead to Rome, not even Bologna. *I found this forgotten Billy Collins poem in my Italy notes as I was looking for a photo to include. It’s like Collins was on my trip, and in my head for weeks after our return. The weekend heat was luscious. We sucked up vitamin-D-rich rays like eggplant absorbs olive oil. Like onions in butter, we sweated lightly, turning over occasionally, without urgency, browning slowly. Warm breezes slid over skin like strawberry sauce over vanilla ice cream, coating palest white with a rosy blush. But all was not well in Stumptown. A week earlier, amidst chill rains and unrelenting gray, a dinner date had been set: Family. Sunday. Lunch. Though I don’t watch the weather, even I’m aware that winter’s coming to a close, and with it braising season. So what better occasion to cook up the gorgeous oxtails recently purchased at my Korean grocery? b2 craves rich, saucy dishes regardless of the season, and if they include membranes, marrows and the chance of mad cow disease, so much the better. You can see where this is heading. The perfect storm. The tragedy that was Sunday. Thawed Friday night and started Saturday for defatting, there was no going back, even as the mercury continued to rise. In the oven, the Le Crueset gathered steam, simmering mirepoix, wine, thyme, tails, merrily away, sending yeasty wafts out the open doors and windows to mingle with the neighborhood scents of fluid-drenched charcoal, sizzling burgers and newly shorn lawns. On Sunday, I pushed ahead, like a lamb to the slaughter, adding roasted mushrooms, fresh slivers of carrot, a sprig of rosemary and more wine for a final hour of folly. “But wait!” you cry. “Replace the carmelized zucchini side with lemon-spritzed, reggiano-topped asparagus! That’s spring in every bite.” Oh but how b2 detests asparagus. “Okay then for god’s sake ditch the mashed potatoes and boil up some pasta instead.” Disgust has crept into your voice. Don’t deny it. I hear it behind that facade of helpfulness. But my pantry had let me down. I had pappardelle enough for three, maybe four, but not the five I needed. And besides, what would I do with four pounds of potatoes? I’d finally tossed the remaining Christmas russets abandoned in the basement…russets, for chrissakes…good for so little… And though I’m infamously cheap, the coffin was nailed: I had a real reason for not switching starches. The horns of the dilemma on which I sat were as pointy as the oxtails themselves. 1) Can one, in good conscience, toss a pile of bones onto a silky nest of pappardelle? Even if you deboned half, how could you achieve the proper per-mouthful proportion of chewy, succulent meat with slippery, starchy noodle? Where might the grated cheese land and melt? How could one manage the complexity of twirling a fork with one hand while maintaining a good grip for gnawing with the other? 2) And if I chose to pastacize properly, could I live with having denied my family the domed gel caps of semi-soft cartilage, the nooks, crannies and spines just begging to be sucked and scraped? Rich sauce is all well and good, but it’s the cartilage that makes life worth living. And so it was. Out in the blazing 2 o’clock sun we faced our demons, sweating and laboring, battling lunch and attempting to quench our thirst with a rich bottle of Sicilian red that held its own as it morphed from cellar-cool to lukewarm to hot over the course of 20 minutes. The dog snoozed in a shady patch of dirt. Oblivious to our pain, BB texted his glee at his first G&T and grilled steak of the season. Like Spartans rushing headlong to certain death at Thermopylae, we soldiered on. In the distance, children laughed. Extra! Dish in mourning as tragedy strikes. Trader Joes has stopped carrying Plugra European style butter. Curse them and their fickle ways! I’ve yet to get over the loss of Marcel et Henri pate de campagne, and now this blow? Being lower in moisture and higher in butterfat than conventional butters…thus taste-transporting me to Europe with a single bite…is all well and good. Being barely more expensive than commonplace, skinny-bricked butter is an added bonus. 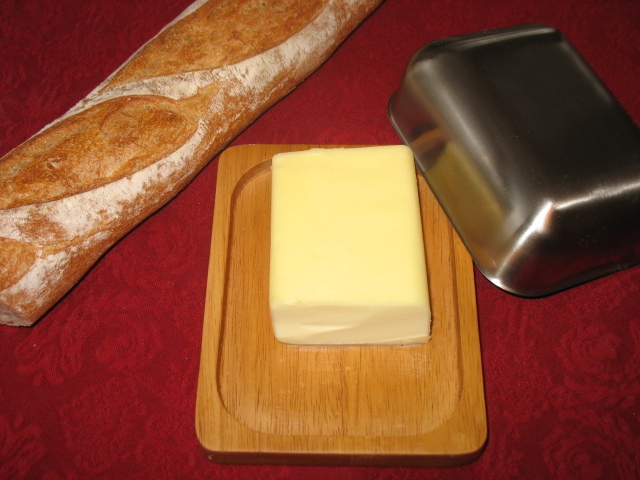 But fitting perfectly into my new butter dish, hand-carried from France? Priceless. Bought Kerrygold Irish butter instead (extra wide as well) but at twice the price and half the height, I’m heartbroken. A brick more sweetly than dishes of yore. Of pats, dollops and bricks neath yon domed pate? Sweet porcine perfection and lore, what chance! And now, on wooden splendor reclines. Are sweeter still. Therefore ye cooks rage on! Whether blanc’d, emulsed, bernaised or ghee. I, choose this cream, this fatted Don Juan. “O happy fat! Most happy fat!” I utter. Fat is flavor flavor fat. None other truth. Truth, in butter.